Apple today announced it is launching a new 9.7-inch iPad equipped with an A9 chip and a brighter Retina display to replace the iPad Air 2, which has been discontinued. The tablet, which Apple is simply calling "iPad," is Apple's new entry-level model at the 9.7-inch size, starting at $329 for 32GB and $429 for 128GB. 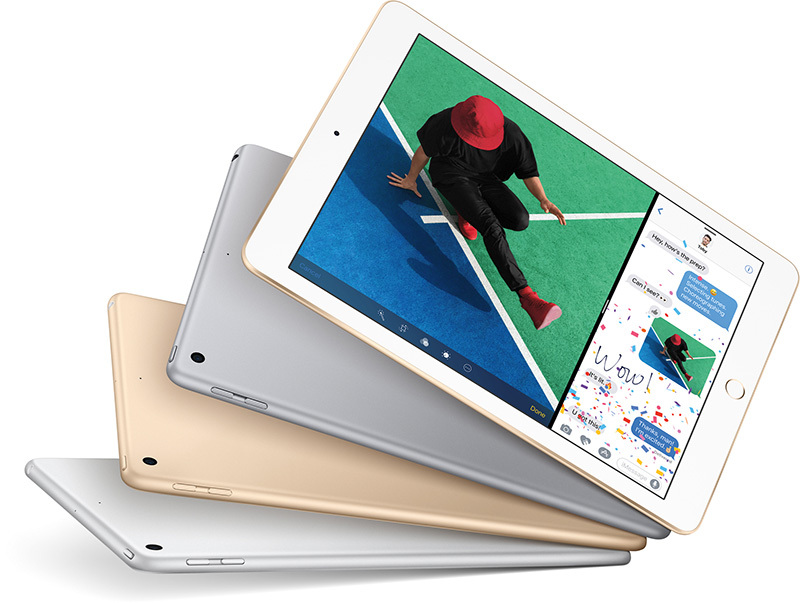 The new 9.7-inch iPad is similar in many ways to the iPad Air 2, which had an A8X chip and started at $399, but slightly thicker and heavier with a faster A9 chip and a brighter Retina display. Another difference is that the new 9.7-inch iPad does not have a fully laminated display or anti-reflective coating per its tech specs. Beyond the A9 chip, those specs include a 9.7-inch screen with 2,048‑by‑1,536 resolution and 264 PPI, 8-megapixel rear-facing iSight camera, 1.2-megapixel front-facing FaceTime camera, two speakers, Lightning connector, 3.5mm headphone jack, Touch ID with Apple Pay, Wi-Fi 802.11ac, and Bluetooth 4.2. Given its price point, the tablet lacks most iPad Pro features, including a True Tone display with a wide P3 color gamut, Smart Connector, Apple Pencil and Smart Keyboard support, 4K HD video recording, LTE Advanced, Live Photos, True Tone flash, and four-speaker audio. The new 9.7-inch iPad is available to order beginning Friday, March 24 from Apple.com, and starts delivering to customers and arriving next week in Apple Stores, through select carriers, and at Apple Authorized Resellers in the United States and more than 20 countries and regions. Namely, the March 24 launch will also include Australia, Canada, China, France, Germany, Hong Kong, Italy, Japan, Netherlands, Spain, Sweden, Switzerland, and the United Kingdom. Denmark, India, Mexico, Norway, Russia, Turkey, and other countries will follow in April. Brazil and Taiwan, among others, will follow in May. This low-cost 9.7-inch iPad was accurately rumored by KGI Securities analyst Ming-Chi Kuo in August 2016. So they renamed iPad to iPad Air and then renamed iPad Air back to iPad. That is so innovative! Another iPad to the already messy, fragmented, unnecessarily long line up of iPads to saturate the already saturated mobile market while continuing to leave the demand of Macs behind.. I'd love to say we're losing faith Tim, but that was so long ago now. Meh. I gotta go find a computer company. But why take down the store for 8 hours? This looks an incredible deal for those looking to buy into iPad. Investors will be delighted. The mini is now more expensive than the Air? How can anyone be disappointed? This was a silent update with no event. Were you really expecting new products?